When they coined the phrase "Big things come in small packages," they must have had in mind the Atlanta Cyclorama & Civil War Museum. The centerpiece of this attraction is the world's largest oil painting—the Atlanta Cyclorama. Also inside the modest-size building is a steam locomotive, a full-on museum, a theater, and a gift shop. 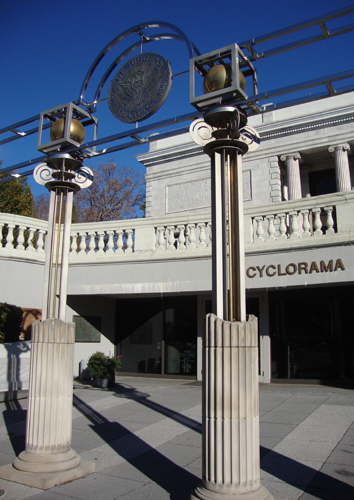 I had never been to the Cyclorama, other than walking past the building on my way to Zoo Atlanta, which it's immediately adjacent to. That was partly because the building "seemed" modest in size. So, I wasn't enticed to schedule a whole afternoon for such a small space. "I'm in the mood for a marathon tour," I kept thinking to myself. As Vivian Ward (Julia Roberts) told the shopkeepers on Rodeo Drive, "Big mistake. Big!" Focusing on indoor tour options (It's been in the 20s and 30s Fahrenheit this week in Atlanta. ), I finally decided to visit the Cyclorama. It's all indoors and the (free) parking is very close to the entrance (I still have to pull my hat and gloves out of storage!). The Cyclorama building is actually quite impressive…even more so once you're on the grounds. On the entrance level there's a Civil War cannon (facing away from the building…always a good idea) and a modern steel and brass arch supported by four columns, artistically melded into classic sandstone columns. On the second level, accessible via a broad open-arm staircase, there are four multi-story columns flanked by relief carvings on either side. The building seemed small, but it turns out that it's actually rather stately. Photographs are permitted everywhere except in the theater and inside the Cyclorama itself (you can take as many photos as you like in the Museum). I'll offer some highlights, but know that it's a must-see-in-real-life exhibit. The Cyclorama depicts the events of the Battle of Atlanta…the turning point in the American Civil War. It's the world's largest oil painting and one of only three cyclorama paintings in the United States. It's painted not on canvas, but on fine linen and weighs nearly 10,000 pounds. It's as tall as a four-story building and if laid out flat (Hopefully nothing like that would ever happen to an irreplaceable piece of history! ), it would span approximately the length of a football field. The painting took only two years for 11 artists to complete (1864-1865). Commissioned by Illinois Senator John A. Logan, who died two days before its completion, the Cyclorama has passed hands numerous times, but eventually returned to Atlanta. It has been on display in Historic Grant Park since 1893 and housed at the Cyclorama since 1927. Immediately in front of the painting is a 360 degree, 30-feet deep diorama that was added in 1936. 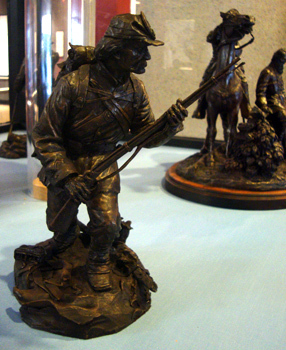 Crafted of Georgia red clay and other materials, the diorama features models of 128 soldiers (the tallest is three feet, the smallest is 17 inches). Other depictions in the diorama include roads, railroad tracks, and trees destroyed by cannon fire. Our tour guide told us that Clark Gable visited the Cyclorama in 1939, the year Gone With the Wind premiered here in Atlanta (he played Rhett Butler). It was said that he commented that the exhibit was good but that it would be great if he were part of it. Later, his likeness was added to the diorama…probably not as he'd imagined, Gable is portrayed as a fallen Confederate soldier. "…the deafening blast of cannons, the soldiers' screams and the earth-shaking charges from the infantry fill the room. It's July 22, 1864. In a desperate attempt to thwart the destruction of Atlanta, General John B. Hood has launched an offensive against the better equipped federal army. By the end of that day, the injured, dead and missing would total nearly 12,000." The Atlanta Cyclorama is the most detailed account of a single day in human history that I have ever seen or experienced, a day that would forever shape the future of Atlanta and the country. 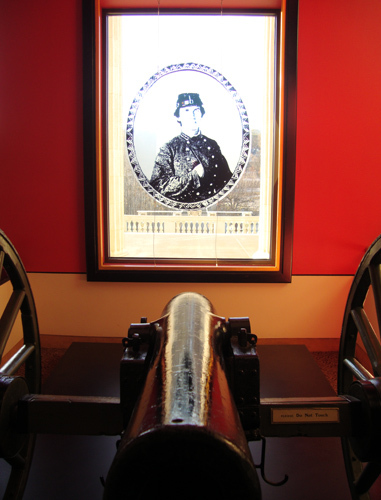 The tour of the Atlanta Cyclorama & Civil War Museum is a hybrid guided and self-guided excursion. 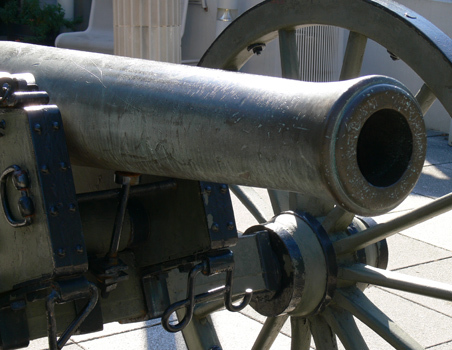 The guided portion of the tour consists of a welcome and viewing of a 14-minute film about the events that led up to the Battle of Atlanta, known as the Atlanta Campaign. The film is very well presented and includes all live footage (reenactments of the various battles of the Campaign). It's narrated by the booming voice of James Earl Jones. The Atlanta Campaign film ends at the conclusion of the Campaign, the day before the Battle of Atlanta. The tour continues inside the Atlanta Cyclorama. My group, as are all visitors, was welcomed into the Cyclorama theater being advised that the best seats are on the third row and above. The theater in which visitors sit, massive itself with 184 seats, rotates 360 degrees. It turns one full revolution during an automated-narration program and once more when visitors are welcomed to the observation deck and the tour guide shares additional insight into the painting's history. The exit of the tour deposits visitors on the first floor, so remember that there's more to see upstairs (in case you haven't explored that far yet). The Texas is a steam locomotive that played an important role in the Great Locomotive Chase during the American Civil War, also known as the Andrews Raid. 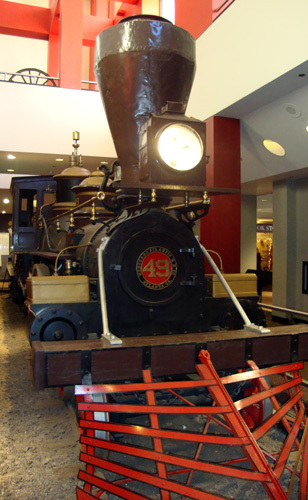 Also part of the Chase was The General Locomotive, now housed in The Southern Museum in Kennesaw, Georgia. We learned in the Cyclorama narrated presentation that the Battle of Atlanta and the preceding Campaign was primarily an effort to disable Confederate train operations in Atlanta, the "headquarters" of the Confederate's supply chain. The bigger-than-life display includes two cars—the engine and its fuel-carrying car—sitting on actual track and railroad ties. The Texas could travel approximately 30 miles per cord (of wood) at a speed of up to 60 miles per hour. 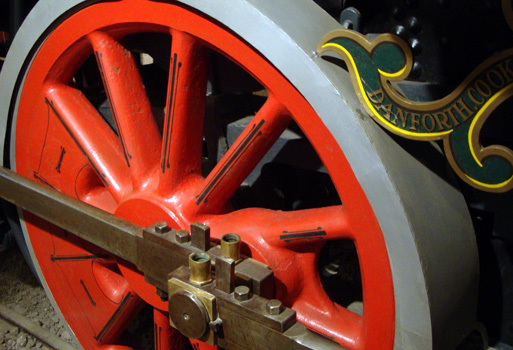 The locomotive was moved to the Cyclorama in 1927 and was fully restored to its original condition in 1936. The only thing that I found perplexing about the Texas display was the tiny train models seemingly haphazardly placed around it on the ground. The Texas seemed to be Gulliver, in a world of trains, and the tiny model trains were Lilliputians standing silent in fright and awe. By time I wanted to pose a question about the teeny-tiny trains, the ticket office and gift shop had closed and the tour guide was off with the final tour group (obviously there were people who were on duty, but I didn't go on a hunt). I have to assume they are relative to the display, but the scale threw me off. I think the impact of the gigantic Texas is plenty on its own without the distraction of tiny trains. I'm sure the Lilliputian trains would have an even better story of their own to tell if in a different display…but that's just me. The majority of the Museum's collection is located on the second floor (although there are quite a few historical artifacts on the first floor where the Texas locomotive is located). 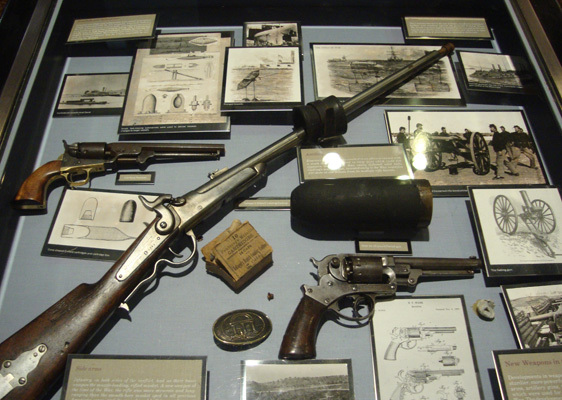 The artifacts include battle paintings; guns, rifles, artillery and other weapons, including cannons; and displays about recruiting for the War and camp life, as well as uniforms and hundreds of photographs. There are also video stations throughout the Museum. The videos share highlights of the American Civil War and one provides insights into the restoration of the Cyclorama painting. 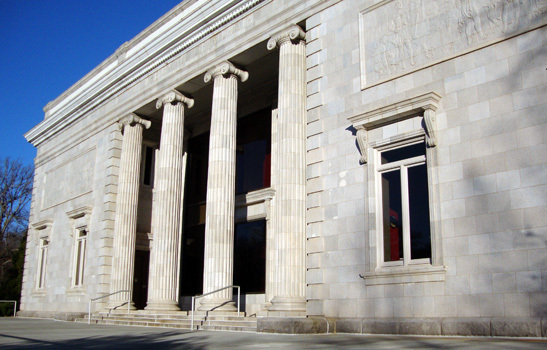 Complementing the museum collection are several art pieces, including original oil paintings (other than the Cyclorama itself) and bronze statuary. 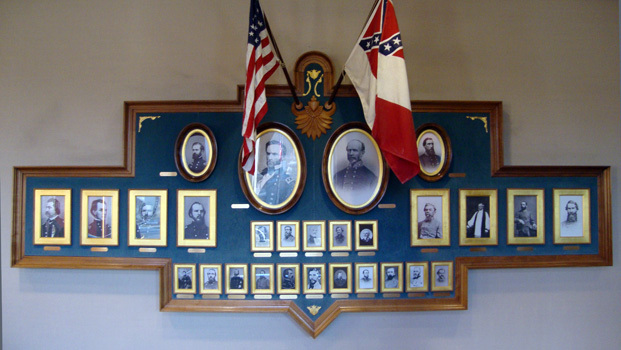 There's also a display, period in presentation, of portraits of the leaders of the American Civil War. All in all, the Atlanta Cyclorama & Civil War Museum is an excellent place to learn about the War and the Cyclorama is quite possibly the closest one can come to experiencing what it might have felt like had one been an observer on that particular bloody day in July 1864. Have I had enough of American Civil War history or will I return for another 360 degree tour of the Battle of Atlanta? I must admit that I was surprised at the amount of information packed into what seemed, to me, to be a small space. I spent quite a bit of time exploring and there's still more to see. 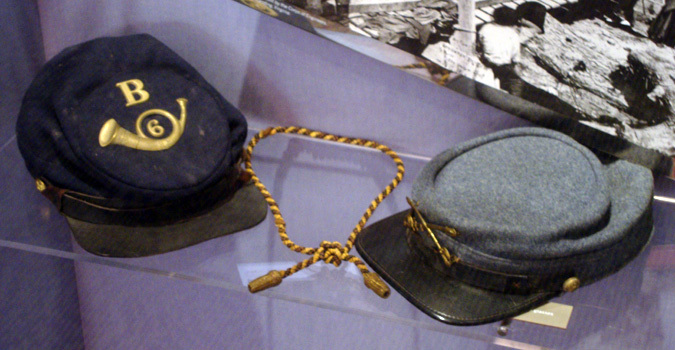 I would very much enjoy returning with an American Civil War buff…there's a lot to learn about the four-year war and I've always been as much a fan of history as I have been of the future. Anonymous...thank you for the kind words. I'd be happy to help. Connect with me on Facebook (Travis S. Taylor) and we'll go from there.